The design is very detailed with a central round amber stone surrounded by a further four stones which are oval in shape. All five are cabochon set. Between the amber strands of silver make an intricate pattern. A pretty silver plated ring set with a radiant labradorite gemstone. Ladies 925 Sterling Silver Sapphire & Vibrant Amethyst Ring Size U.5 uk. NEW. 925 Sterling Silver yellow gold and black rhodium plated large oval Cabochon Green Onyx ring Size P US 8.25. quality handcrafted artwork designer ring that has an oval cabochon natural Green Onyx stone. 925 stamped - weight is 14.8 grams. quality Artwork Designer handcrafted ring. sent out carefully wrapped in a gift box for you. ​overall size of the top of the ring is 2.5cms x 2.2cms. ​unique handcrafted Artwork Designer Ring. ​overall size of the top of the ring is 2cms x 2.8cms. Stone Used : Peridot, Citrine And Smoky Quartz Stone. Size : 8.0 US (Adjustable). Product Code : 7257. 925 stamped. ​stunning one off handcrafted designer ring. Weight of ring is a heavy 20.1 grams. 18.15cts NATURAL Pink rose quartz STERLING silver 925 STATEMENT ring size S.5. Condition is New with tags. Dispatched with Royal Mail 2nd class. Black rhodium plated sterling silver ring band. Weight of ring is 10.7 grams. ROUND CABOCHON HUGE BEIGE FOSSIL CORAL 925 STERLING SILVER RING SZ M 6.5. Pretty Cabochon Huge Round Beige Fossil Coral. rose gold plating around the edge rim of the stone and black rhodium plated ring band. Ring has slight gold plating around the stone. Special 925 Sterling Silver yellow gold and black rhodium plated Green Prehnite and pinky red ruby large round Sunflower design ring is black - ring is black rhodium plated with yellow gold plating and has a large round natural green Prehnite cabochon stone (1.5cms) - there are also four round pinky red ruby. 925 stamped. quality artwork handcrafted designer ring. weight is 15.8 grams. Pretty Square Cabochon Purple Copper Turquoise 925 Sterling Silver White and Yellow Gold Plated Ring Sz R US 9 adjustable. yellow gold plating around rim of the stone. 925 stamped - 8.3 grams. ​nice handcrafted Artwork designer ring. ​unique handcrafted artwork designer ring. 925 stamped. Rhodium Plated Flamingo Bird Ring Sz S 9.5. 925 stamped. a one off beautiful handcrafted Artwork Designer ring. weight is 16.9 grams. 925 stamped. weight is a heavy substantial 22.3 grams. Lovely Natural Pear shaped Yellow Citrine and Blue Sapphire 925 Sterling Silver white and rose Gold Plated pretty slanting Design Ring Size P US 8. ​at one end there are three small round blue sapphire stones. Wonderful Heart Pear shaped carved Pink Rose Quartz and Rhodolite Garnet 925 Sterling Silver Ring Size N US 7. 925 stamped. a one off quality beautiful handcrafted Artwork Designer ring. Sent out in a Gift Box. LARGE 925 STERLING SILVER OVAL RED CORAL CHUNKY HANDCRAFTED BALI. Large Oval Red Coral 925 Sterling Silver chunky handcrafted Bali ring Size L1/2 US Size 6.25. ​925 stamped - there maybe a slight variation in coral pattern as photo is of ring sold. Beautiful aquamarine gemstone ring set in 925 sterling silver. The stone is a lovely deep sea green/blue colour and has been polished en cabouchon. Depth of silver mount: 5mm. Stone: 25mm x 15mm. WELO OPAL RHODOLITE GARNET SPINEL 925 STERLING SILVER GOLD FROG FLOWER RING SZ Q 8.5. Large Ethiopian Welo Opal, Rhodolite Garnet and Black Spinel 925 Sterling Silver. fab unusual ring that has a frog with an opal cabochon stone on its back - two spinel stones for its eyes - the ring also has a large gold plated flower with a rhodolit garnet stone in the centre. ​overall size of the top of the ring is 3cms x 2.5cms. ​unique handcrafted Artwork Designer Ring. make Supersized seem small. Pretty three stone oval cabochon Pale Green Prehnite 925 Sterling Silver handcrafted long ring size R - US Size 9. 925 stamped. sent out carefully wrapped in a gift box for you. 6 grams weight. Fab Heavy Large 925 Sterling Silver Oval Natural Cabochon Rose Quartz white and rose gold plated handcrafted Artwork Desiger Ring Size P1/2/Q US Size 8.25/8.5. 925 stamped. ​Sent out in a Gift Box and by. LARGE WHITE BAROQUE PEARL GREEN PERIDOT 925 STERLING SILVER BLACK RHODIUM GOLD RING P1/2 8.25. Natural Baroque White Pearl and Green Peridot 925 Sterling Silver Black Rhodium Gold Ring Sz P1/2 US 8.25. A lovely handmade forged studio piece with lovely character. Not marked but tested as Sterling Silver. A lovely quality ring. Beautiful White Baroque Pearl 925 Sterling Silver Yellow Gold and black rhodium Plated handcrafted Ring Sz Q US 8.5. 925 stamped - nice ring which has a large natural white baroque pearl decorated at the side with gold plated flower and leaves. The onyx is faceted and simply mounted. Size of Onyx: 25mm x 20mm. Depth of Silver Mount: 5mm. Fab Huge Grey 35 ct Oval cabochon Dendritic Jasper 925 Sterling Silver Black Rhodium Yellow Gold Ring Sz Q US 8.5. HUGE 35CT GREY DENDRITIC JASPER 925 STERLING SILVER RHODIUM GOLD RING SZ Q 8.5. thick black rhodium ring band and yellow gold plating surrounding the stone. LARGE OVAL HANDCRAFTED BALI RED SPONGE CORAL 925 STERLING SILVER RING SZ N 7. Large Oval Handcrafted Bali Red Sponge Coral 925 Sterling Silver Decorative Floral Ring Size N US 7. 925 stamped - 8 grams. 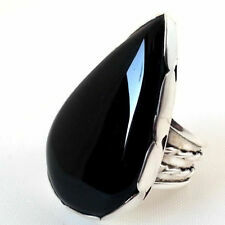 Fab Oval Purple Iolite and Green Onyx 925 Silver white gold plated Ring Size P/P1/2 US Size 8/8.25. ​handcrafted artwork designer decorative ring which has an oval purple iolite stone (8mms x 6mms) and two small round green onyx stones set in decorative curved setting. Moonstone is considered, as healing crystals known to bring the wearer peace and harmony with one's mind, body and spirit. The mysterious moonstone has been used for centuries in a variety of cultures. CABOCHON HUGE BEIGE FOSSIL CORAL 925 STERLING SILVER RING SZ N US 7. Pretty Cabochon Huge Square Beige Fossil Coral. 925 Sterling Silver Ring Sz N US 7. yellow gold plating around the edge rim of the stone and black rhodium plated ring band. Large Oval Cabochon Lavender Mauve 925 Sterling Silver yellow gold plated chunky Handcrafted Artwork Designer beautiful Dome Ring Size P US size 8 - top of ring measures 2cms x 1.8cms - 925 stamped - cabochon stone measures 1.2cms x 1.5cms. Sterling silver 925 cabochon Pietersite ring UK Q¾/US 8.75. Gift bag. This is a chunky cabochon ring, with a solid silver mount and band, featuring striking pietersite stone. Handmade in India with 925 silver. Band width 3 mm minimum. UK size Q ¾. 925 Sterling Silver Yellow Gold and Black Rhodium Plated Artwork. ​ 925 stamped - weight is a heavy 21.2 grams. ​2.5cms x 2.2cms is the overall size of the top of the ring. designer handcrafted Ring. sent out carefully wrapped in a gift box for you. Sterling silver 925 cabochon Bumble Bee ring UK R/US 8.75. Gift bag. 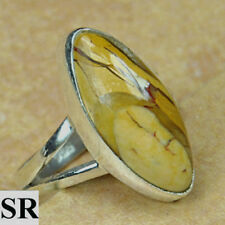 This is a striking cabochon ring, with a solid silver mount and band, featuring Bumble Bee jasper stone. Handmade in India with 925 silver. Band width 3 mm minimum. Weight is a heavy 12.2 grams. Top of ring is 2.5cms. weight is a heavy 25.9 grams. Large Oval Handcrafted Bali Sponge Red Coral. 925 Sterling Silver Ring Sz R US 9. 925 stamped - 6 grams. make Supersized seem small. 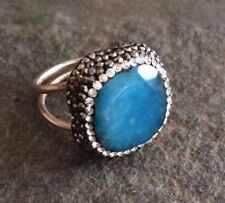 CABOCHON BLUE LARIMAR 925 STERLING SILVER RHODIUM GOLD RING SZ P 8. Pretty Cabochon Oval Blue Larimar. 925 Sterling Silver Black Rhodium yellow Gold Ring Sz P US 8. 925 stamped - 8.7 grams. nice ring with a quality stone.